The other day I laughed A LOT! I watched Sightseers (2012), the follow up to Ben Wheatley’s excellent crime horror thriller Kill List (2011). 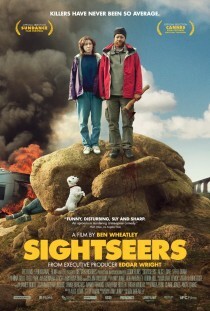 Sightseers is a very funny black comedy thriller. It starts low-key, building slowly to a perfect finale. It is well-worth the patience! Filmed in my very own North Yorkshire, UK, Sightseers is saturated with distinctly British humour. This film is 80% about the characters, 20% about the action. I would say it does not hurt to know this before you sit down to watch it. You know, get your expectations in order and all that. I highly recommend this film to anyone who likes to have a good laugh and does not mind occasional gruesomeness. Wheatley has already made a follow up to Sightseers: it is called A Field in England and will be released on 5 July 2013. It is a British historical film set during the English Civil War of the 17th century. Sounds interesting! You can find more information on this British production on Wikipedia and IMDb. Ignore the IMDb score – what do the masses know – this is a great movie! As always, we recommend you don’t ruin any surprises by reading spoilers and DON’T! DON’T! DON’T! watch this trailer – it gives far too much away. Just watch the film! Sightseers starts acid and very promising, has good cinematography and loads of nice humor but, by the end has lost al of its gas/drive/fun. I’ll speculate this is happening – other than for pace and story reasons – because by then Ben himself has lost hope in the relation… reminds me of (always nasty comparing) von Trier’s Melancholia. So, let’s kill some characters. Both films left a bittersweet nothingness without any use to me. IMHO It’s very difficult to face the void – specially in a relationship – and make something out of it, even harder to keep it humorous. Last film I saw did this (not humor) was Julia Loktev’s The loneliest Planet. But women directors have different stomach and hence approach. Hi there! Many thanks for commenting. What you got out of Sightseers is definitely different to me. Very interesting to hear your pespective. I found Melancholia a very hard watch but will definitely be giving it another go, as Lars von Trier is always worth the time. Many thanks for The loneliest Planet tip. I will look it up! Looks interesting, thanks for the heads up on this one. Cheers. I saw this film! You’re right; it is VERY British. I am American, but I lived in England for a year. I had to smile at all the memories Sightseers brought back. Granted, none of those memories included murdering someone but still. . . The finale is perfect. I don’t know how else it could’ve ended. Good movies I’ve seen recently include Upstream Color, Cloud Atlas and Goon. The first two will make your head hurt; the third is a very well made sports comedy. A belated thank you for stopping by my blog! I am looking forward to reading more of your short reviews. Hi there. Isn’t “Upstream Color” extraordinary! Have you seen his previous film, “Primer”? Read the review I’ve done – it’s also a superb film. I thought Cloud Atlas was absolutely awful! There was nothing about that film I liked. Funny, how different people see different things! By the way, if you’ve switched your blogs, you should be careful to comment using the new one. Commenting from the old one will lose you traffic to http://cheapcinemafile.wordpress.com. I just noticed that. Drat. I will change this immediately. Thanks so much for pointing that out! And I have not seen Primer, but it’s on Netflix so I will be sure to check it out ASAP– and to read your review. Sounds like one I’ll have to add to my watch list, thanks for sharing! Looks a little bit like “Heartlands” (which I loved!!) but probably isn’t! :o) I will watch this anyway. Thanks. Saw Sightseers at the Leeds Film Festival last year and loved it – how could you not love a film that features a giant pencil??! Great blog – and now I’m off to check out Upstream Color, on the basis that Primer was a really interesting, clever film. That pencil scene is one of the funniest I have ever seen! Nice review shrimky, I feel that this film has literally been torn a new one by critics and is not very popular with viewers but I agree with your sentiment, It’s a comedy and it’s funny. mission accomplished in my opinion. I wacthed this very recently – Alan Ayckbourn meets Sam Peckinpah – very enjoyable. as a fellow North Yorkshireman living abroad I’m sure I shall enjoy this…Is it a bit like Heartbeat with gore and black humour then? Thank you for nominating wonderful cinema.com for the Liebster. We have +7000 followers now, so I think it would be fairer if you nominated someone else’s website. But the thought is very much appreciated! Sheesh that’s great…glad to hear there are that many others who appreciate your sound recommendations, keep them coming. Nice review. Really enjoyed this one. I knew very little about it before I watched and I think that’s definitely for the best. Haven’t managed to see A Field In England yet but I’m very intrigued by it.